The amount of details put into the construction of the fantastic worlds of K.J. Parker made this writer one of my all time favorites. The assembled pieces of these worlds and the minor details make each journey within these fantastical realms an absolute delight. Of course, it is not the sole reason for which I love K.J. Parker’s works, the characters and stories get a strong foothold in my memory too and always stand successfully against the passing of time. This year, among the books I would love to have in personal collection is a collection of K.J. 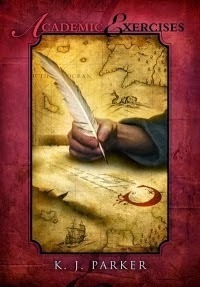 Parker’s short stories released by Subterranean Press and limited to 1000 signed copies. “Academic Exercises” gathers 13 short stories, novellas and essays signed by K.J. Parker in what promises to be a very good looking volume. Now, as much as I am thrilled about K.J. Parker’s collection I cannot honestly say I am completely happy with the path taken by Subterranean Press for publishing it. I could not find any information about a potential publication of a paperback edition of “Academic Exercises” so I will assume that this limited edition it is the only one available for purchase. I am convinced that it would look great on a complete collection of K.J. Parker’s works, but looking over the table of contents to limit it to 1000 copies seems a bit too much. It is true that most of the stories published in “Academic Exercises” can be found for free on various issues of Subterranean Press Magazine, but including the already pricy novellas “Purple and Black” and “Blue and Gold” and the short story “A Room with a View” from “Subterranean: Tales of Dark Fantasy 2”, all previously released by Subterranean Press, in this volume feels like demanding too much from those who already bought those editions. It could be said that there is a balance between the free stories and already released ones, but I still cannot shake the uncomfortable feeling I get looking over the full table of contents. It is also true that one is to stare at a computer screen while reading most of these stories and another to see them printed in a wonderful volume, but I still wish I could see a more financial accessible edition for K.J. Parker’s “Academic Exercises”, one that would reach and delight more readers who would like to add a physical copy of the collection to their personal libraries. But who knows, maybe indeed in the future a more accessible edition would be available. However, let’s finish in a lighter tone and for that let me admit that I am completely happy to start the year in style with another short story by K.J. Parker, “I Met a Man Who Wasn’t There”, published by Subterranean Press on the latest issue of their free online magazine. I understand your discomfort on the one hand and the wish to get one of the limited copies on the other hand. In the end selling books is a business like other And which company would deny to get as much profit as possible. Anyway fingers crossed the you get one of the limited copies. It is very true and I am not the one to forget that the book industry is a business. And like any other business it is very tough to live without a profit. But in this case it doesn't seem right for those who already have the two novellas or the short story to make another purchase of them. If instead they went for some new, original stories for this collection it would have been better in my opinion. Or if "Academic Exercises" becomes available as a more affordable edition and with larger print run.